My great-grandmother, Rosalie Sifling, could bake. I don't remember that, as she was pretty old by the time I came around. My food memories of her include canned beets, and head cheese sandwiches which my mom let us sneak into her apartment building's incinerator. My mom remembers her grandmother's perfect nut roll, however. I remember my own grandmother making his recipe for Thanksgiving and Easter, where my mom, aunts, and I would eat it with our coffee while we cooked those meals. My mom and my aunts can bake as well as their mother and grandmother. I can bake too, but there are always a few recipes I just let them do. 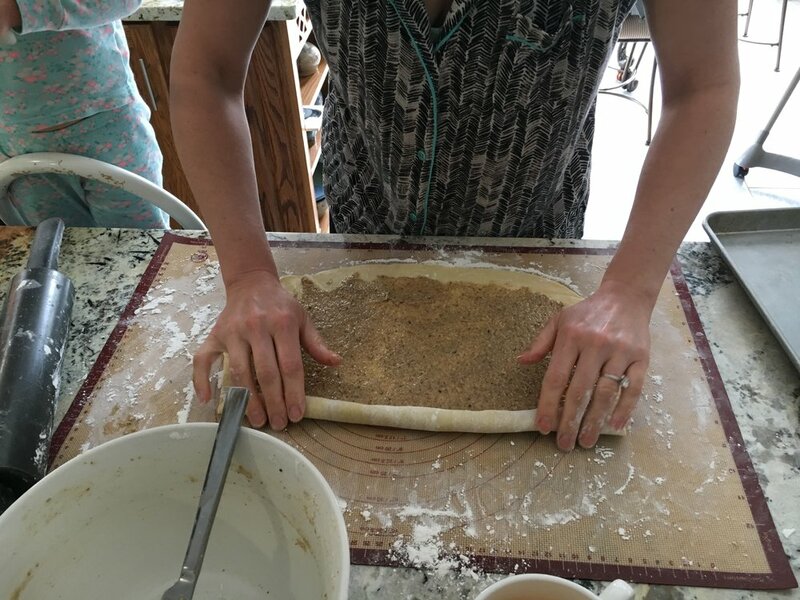 This year, however, I decided to take part in my mom's nut roll baking, so my daughter remembers her mom's hands in the flour, like I do mine. This nut roll is tender with the perfect balance of sweetness and buttery crust. It is unparalleled with coffee. It freezes like a dream. I plan on making a batch soon to freeze, because it's the perfect thing to throw in a basket when someone is born or someone dies. And, Lord knows, someone is always doing one of those things. Mix together dry ingredients: flour, baking soda, salt and yeast in a mixing bowl and set aside. Mix together sour cream and egg yolks in a small bowl and set aside. Cut 2 sticks butter into the dry ingredients, like you would a pie crust. Mix in sour cream mixture with a dough hook attachment, if you have one. If you don't, use the paddle or beaters. When the dough is smooth and soft, dump it out, cut and shape into four small equally-sized balls. Wrap each ball in waxed paper and refrigerate overnight. The next day, remove the dough from the refrigerator to take the chill off while you make the filling. Beat eggs whites until stiff, not dry. Fold in the sugar and ground nuts until incorporated, careful not to over-mix. Roll dough into a 15” x 12” rectangle on a floured surface. Spread 1/4 of the nut filling onto the dough, leaving a 1” unfilled space on the long edge. Moisten your finger and run it along the unfilled edge of dough. Roll the long way, and press the moistened edge to seal. Tuck the ends under. Repeat with remaining 3 balls of dough. Then, bake 2 rolls to a sheet for 20 min. Cool, then dust with powdered sugar. They are even better the next day, or out of the freezer.